This writing is one of the selected essays done by undergraduate students of “Organizational Communication” from University of Indonesia, the faculty of social and political sciences, international communication program of public relations 2013. Inspired by the same spirit, Kediri Bertutur takes the undergraduate students on their own cultural journeys. Kediri Bertutur presents Nadine Kamarwan’s personal writing after taking a look into Indonesia’s history of Majapahit kingdom. BACKGROUND: Indonesia is a huge country made up of a convergence of thousands of islands, rich in both culture and natural resources and equipped with one of the world’s largest populations, it would not be difficult to imagine Indonesia in a high position of power on an international scale. It is one of the most heavily populated countries in the world, with an economy that has joined the ranks of the top twenty biggest economies on the planet that is still rapidly growing. Within it are people of diverse ethnicities with seven-hundred distinct spoken languages, plants and animals unlike those that can be found anywhere else in the world, and inarguably the most amazing food in the world. However, even with all these resources, Indonesia is still far from the powerhouse that it has the potential to be. After years of colonization and oppressive regimes, what was once a glimmering country rife with the potential for greatness, the flowering bud that was Indonesia seems to have wilted. In all those years, what could have possibly changed a country so drastically? INTRODUCTION: Nationalism, the pride one has in his/her country used to be all the rage back in the twentieth century. This was the period in which nationalism was at its peak importance to fight against the imperialists and gain independence. Another time nationalism ran rampant throughout the streets was in the overthrowing of the Soeharto regime in the late nineties. From these two events we can conclude that nationalism and patriotism is most prevalent in times of oppression in which the people demand freedom and fight against injustice. However, in recent years, with minimal conflicts be it within the country or outside of it, Indonesia has entered a state of relative peace. The force of nationalism that was once needed to solidify the country in the collective fight against oppression slowly fell out of fashion. In the current age less and less people are interested in their own country. Globalization has introduced us to many new interesting cultures that we want to assimilate into our lives. And the recent state of politics within Indonesia has led many young people to become cynical and disdainful towards their own country, as one would be when constantly being bombarded by said nations terrible aspects from all media. The international reputation of Indonesia could also do with some help. Though it is undeniable that Indonesia is beautiful and its natural resources and beauty is plentiful, this does not distract the international community from Indonesia’s many flaws. According to Transparency International, an organization focusing on international corruption, Indonesia ranked one hundred fourteenth out of the one hundred seventy-seven countries being evaluated 1. Within South-East Asia, Indonesia is the wealthiest country, however when taking into account the population of each country, the numbers drastically change 2. As a large country with a huge population, it is not a walk in the park to keep this country morally upright and going in the right direction all the time, thus leading us to the outside perception that Indonesia is poor, that we are lazy, that we are terrorists and corruptors, that we are uncivilized and a third world country. These incorrect outward perception of Indonesia also plays a role in the way we as our countries citizens view ourselves. It is not that Indonesia’s potential has faded, it is merely that many of our people still fail to see it, and many that do fail to utilize it for the improvement of the country and its people as a whole. In the modern era, though we are in abundance of peace, pessimism and cynicism regarding our own country still runs rampant amongst the people. With the advent of globalization and the rise of the middle class, more and more individuals are losing their sense of national identity. Though change is inevitable and good, the collateral damage lies in the form of our culture and traditions. Changes in time have caused a dissonance, a rift between rich and poor, between traditional ways and new more “glamorous” western sensibilities, between people who try to preserve the old world and people too eager to move on into the sparkling new. Though we cannot fault those who wish to press forward, there is still much to learn from our ancestors, whose leadership built kingdoms and forged bonds amongst the islands far before the creation of modern day communication technology. The main issues that modern day Indonesia are facing are mainly the decline of a national identity and morale. This one issue can lead to a slew of even more pressing matters such as the dissolve of Indonesian customs and traditions. Another big problem lies in our geography. As Indonesia is a country separated by bodies of water we are relatively detached from island to island, most of the development and population are concentrated in the island of Java leading to inequalities and uneven distributions of power, education, and representation. This issue further adds to the waning national identity that is the only thing holding out scattered islands together. So now comes the question of how we can restore Indonesia to its original glory, the simple answer to which lies in looking back into our past, to the era of the great kingdoms. Mainly, the kingdom considered the greatest of all of Indonesia’s ancient kingdoms, The Majapahit Empire. MAJAPAHIT: Majapahit was one of the great empires of Indonesia’s past and although it was based on the island of Java, it was the biggest empire to have ever formed in South-East Asia with territories reaching out as far as some of the Philippine islands. It was established in the thirteenth century, reached its peak power on the fourteenth century before its eventual decline in the fifteen hundreds. Frequently dubbed as the greatest era of Indonesia, the Majapahit Kingdom was known for its grandeur, palaces decorated in gold, extravagant homes for the royals, and plenty of spices for trade. In books written by travellers, merchants, and other world leaders of the time, no intricacy of the Majapahit lifestyle was left out. It was this grandeur that attracted many to the kingdom, some for trade, others for less noble purposes. Much of the information that can be found about the Majapahit Kingdom can be found in the eulogy to Majapahit King, Hayam Wuruk, “Nagarakretagama”. Within it details the traditions, ceremonies, historical figures, and a detailed description of the kingdom itself. The main production of the kingdom included spices and rice as well as craftsmanship and their architecture. Most of their economy is built on spice trade and trade of their natural resources such as woods and other plants, fruits, and vegetables. The Majapahit Kingdom also had a currency system made out of coins made of silver and gold. Later on, however, the currency changed into copper cons brought to the kingdom by Chinese traders and merchants. The kingdom also had and implicated a tax system to be paid in cash. They were well versed with foreign trade and had trade agreements and arrangements with various neighbouring kingdoms reaching as far as South Indian empires. Through the artifacts that they left behind, we are able to gauge the values and principles that people of the Majapahit kingdom had at the time. From their architecture through which they’ve decorated with traditional stories and art, we see their kingdom depicted as an agrarian society focusing on agriculture and the cultivation of the land, they valued craftsmanship and art, they were well versed with the technology available to them at the time and were able to use said technology efficiently and usefully in the building of their kingdom and civilization, and they were very aware of city planning and environmental management. Majapahit, being a Hindu kingdom, also holds traditional Hindu values. These values are known as the “Nine Beliefs of Hinduism”. These beliefs include the belief in one supreme divine being, the belief in an eternal cycle of creation preservation and destruction, the belief that life is sacred, the belief in destiny through karma, the belief reincarnation, and the belief in an unseen world occupied by divine beings among many others. If they had followed these beliefs thoroughly, it would be safe to assume that the Majapahit people were tolerant and accepting and valued life and faith. Being a large empire, it is not surprising that one of Majapahit’s goals was expansion into new territories. They did this through expedition, both naval and military. However, rather than pillaging and taking, they settled for a more diplomatic route and build alliances. Several of the things we can learn from the values they hold include the acceptance and tolerance of one another, the appreciation of art, their community building skills, as well as their respect towards nature and the environment. We have much to learn from our ancestors, proven by how prosperous of a kingdom they’ve created. Aspects of the ancient civilization still permeate into our modern culture and the basis of our country. Our national motto, “Bhinneka Tunggal Ika” originates from a Majapahit poet. Majapahit was believed to be the ideal society by many Indonesians, our very first president, Soekarno, even tried to shape this new country after the old glory of the fallen kingdom. We have established that, yes indeed, the values of Majapahit has incorporated itself deeply within our country’s sould, henceforth, the challenge will be how to peak the interest of the public regarding the old ways of Majapahit as well as how to best communicate this information to the public in a way that will be game changing and revolutionary. CAMPAIGNS: There is much to learn from the Majapahit era. Some valuable lessons can be learned and applied to modern day Indonesia in hopes to solve several of our current issues. Therefore, it is imperative for the nation to look back into our history and mine it for said lessons. The first step to doing so would be to raise public interest in the topic, then to raise awareness about the Majapahit Kingdom, and lastly to infuse understanding on the traditions and customs of the Majapahit people thus enabling the public to see the benefits of bringing back some aspects of our traditional lifestyle. Some of the things that are able to each us may even help solve the discrepancies between the islands of Indonesia and establish a stronger national identity for the population. As mentioned previously, the campaign will aim to inform people about Majapahit and ingrain their values into modern day Indonesia; such values include community building, appreciation of the arts, being more environmentally conscious, and the building of acceptance and tolerance for all. The key message we hope to deliver with this campaign would be nationalism or pride in one’s nation, that will help solidify us as a country once more under our motto, “Bhinneka Tunggal Ika”. First of all, when creating a campaign it is important to go into it knowing whom to target. In this case, I believe that the ideal target for the Majapahit awareness campaign would be young people, children and students. I believe this is the ideal demographic because it is a ripe age to start nurturing a sense of wonder and openness to new ideas. When children are introduced to a new concept at a young age that interests them, it will stick with them throughout their lives. Young adults such as students can also benefits greatly from learning about the Majapahit era as they are at an age when they are building their identity for the real world and thus integrating such topics into their lives can help foster some national pride and identity, solving one of the key issues of strengthening national identity. Aside from that, the young people of Indonesia will be the future of the country and as such, the campaigns would benefit them the most. CAMPAIGN I – School Visits The first campaign would require experts and historians to make school visits throughout elementary to junior high schools all over Indonesia. During these visits stories and legends from the Majapahit era can be told to the students and activities such as arts and crafts and planting trees and harvesting food from farms in accordance with the Majapahit values of appreciating the arts and respecting the environment. Each school can be visited for a period of about a week each to further ingrain the Majapahit values onto the kids in a fun almost summer-camp-like environment. Museum visits can also be helpful in the education of the children regarding the history of Indonesia and Majapahit. CAMPAIGN II: Online/Gaming Presence With youth as a target audience it is important to optimize the use of the Internet and the online platform. Youths today are wildly regarded as digital natives and in Indonesia a growing fondness of technology has overtaken the young people. Thus, having a strong online presence will be extremely helpful in the hopes of raising awareness and understanding on Majapahit culture as it juxtaposes the old and the new in a seamless way. Several ways to create an online presence may be through the use of a website or social media, however, to really draw in people into the subject there has to be an element of interactivity. This can be achieved possibly through the use of online gaming. An online game about Majapahit has already been created once, named Nusantara Rising, this game was a strategy game in which ones objective would be expansion of territory, cultivating the land, and building villages, it is a single player game with multiplayer functions up to six people. However, though this game is well though out and shows several Majapahit values, a better game to represent the values of Majapahit Kingdom would be on an MMORPG platform. MMORPG stands for Massively Multiplayer Online Role Playing Game in which many people can all log into a server at the same time and play. This will foster a sense of community and togetherness much like the community of the real Majapahit at the time. Players can take the role of a peasant or a king and build villages and form bonds much like they would in real life. This campaign would require many game developers, graphic designers, and computer experts. For the game to garner attention print, TV, and online ads can be placed everywhere as well as employing a celebrity spokesperson. To garner more players, the first few months of the game can be a free trial period in which users can get a taste of the game. CAMPAIGN III: Design Competition The last campaign could be a design competition for clothing or other consumer products focusing around the theme of Majapahit. This can be done with companies such as “Damn! I Love Indonesia,” which is a social media and commerce company dedicated to design around the idea of Indonesian traditional culture. Their aim is to promote the beauty and richness of Indonesian culture specifically at the youth and younger generation, to get them proud to be Indonesian. I believe that this goal and vision has a lot in common with the idea of these campaigns and thus, they would be an ideal partner. The competition can be marketed through social media as well as “Damn! I Love Indonesia’s” website and outlets and registrations can take online. The submissions can be uploaded to the website and the audience will be the ones voting for who wins. Of course, the designs must be based around the Majapahit era and sufficient explanation and understanding has to be achieved by the designers about this era. Therefore, when entering their designs they choose one specific aspect of the Majapahit Kingdom they would like to focus on, create the design, and write a short essay about why they chose to create such design and the significance of it for both the Majapahit era as well as modern times. The winning designs will be available in the shops and the winner will receive a sum of money from the proceeds of the sales. This will encourage youths to research about the Majapahit era and also encourage the Majapahit values of design, art, and craftsmanship. Out of all of these methods, I believe that the most useful and affective one would be the first campaign in which school visits will be employed to deliver the message. Due to the fact that out of all the campaigns, this one has the most potential to reach evenly out to all youths of Indonesia. Campaign number two requires the use of internet connectivity which many rural areas do not have and campaign number three seems to be more Jakarta and big city focused as “Damn! I Love Indonesia” is based in Jakarta. However, I also believe that it can be in our best interest to use the other campaign as well due to the fact of the diversity of the Indonesian public. What may work for some youth may not work for others depending on their location, their resources, their education, beliefs, and how they were raised. To uniformly educate all youths, as we wish to do to try to bridge the gap between rural and urban areas of Indonesia, a variety of methods would be ideal to be used in the spread of this information. Mainly though, no matter what campaign we chose, it has to be fun and interactive for the audience. Damn! I Love Indonesia. (n.d.).Damniloveindonesia.com. Retrieved June 10, 2014, from http://www.damniloveindonesia.com/about. Forshee, J. (2006). Land, People, and History. Culture and customs of Indonesia(pp. 10-12). Westport, Conn.: Greenwood Press. Miksic, J. N. (1999). -. Indonesian heritage series (p. 107). Singapore: Didier Millet :. Inspired by the same spirit, Kediri Bertutur takes the undergraduate students on their own cultural journeys. Kediri Bertutur presents Kimiko Kanani Widjaja’s personal writing after taking a look into Indonesia’s history of Majapahit kingdom. Indonesia Overview: The Republic of Indonesia is located in Southeast Asia and is a sovereign state. A sovereign state is represented by a centralized government and holds possession over independent authority over a geographical area. This beautiful nation is made up of 13,466 islands, 33 provinces and over 238 million individuals. Thus, Indonesia is labeled as the fourth country with the most population in the world. In addition to that, Indonesia’s economy (Gross Domestic Product) is ranked the sixteenth largest worldwide. Thus, this country is considered a member of the G-20 major economies. Indonesia is also a founding member of ASEAN. Indonesia is an archipelago country and its archipelago has been an important element in the trading regions ever since the 7th century. Archipelago, as an overview, is an abundance of islands located in the same area. Kingdoms such as Sriwijaya and later on Majapahit traded items with countries like China and India in said islands. And due to these trades, the rulers of those times eventually became engrossed to the foreign cultures (religion, political ideologies, etc). These influences lead to the saturation of Hindu and Buddhist kingdoms. On the other hand, Muslim traders popularized the Muslim religion and colonization by the Europeans brought Christianity and Catholicism. After three and half centuries of colonization by the Dutch, Indonesia finally gained its Independence on the 17th of August 1945. Our country eventually developed a democratic system and its economy started to grow rapidly. There are hundreds of distinct native ethnic and linguistic groups. However, the largest ethnic group that possesses a political dominance is the Javanese. The majority of Indonesians are Muslims but a portion of the population believes in other religions such as Christianity, Catholicism, Hinduism (for example, Bali) and Buddhism. This country has national motto—Bhinneka Tunggal Ika—, which is defined as “Unity in Diversity.” Despite the diverse population, the individuals strive to become one. There will be no “Muslim Indonesians” or “Christian Indonesians” or perhaps “Javanese Indonesians,” but there will only be The Republic of Indonesia. Indonesia Today: The Indonesians we meet today are quite different from those who have lived during the era of heavy colonization and trades. Nowadays, the individuals are overexposed to the Western culture that they often forget about the national beauty of their own country. The biggest highlight would be the generation of youth. Children and teenagers nowadays are so focused on the technology that has been infused in society that they forget essential aspects such as interpersonal, face-to-face communication and becoming one with Indonesia’s mother nature. As for the children, most of them are born in the electronic era; thus exposing technology to them at an extremely young age. On the other hand, though the number of adults overexposed to technology is not as high as teenagers and children, they have the tendency to focus mainly on expanding their businesses. Expansions would mean going abroad to meet international business partners and going abroad to meet international business partners will sooner or later create an international cultural influence in said adult’s life. As we may already know, Indonesia’s traditions are often neglected by the current society. How often do we hear of Tari Piring? Or Tari Kecak? Do we hear it as often as we hear ‘modern dance’ or ‘hip hop?’ And what about Wayang? Children nowadays watch puppet shows about Western fairytales such as “Cinderella” or “The Little Mermaid” but most of them would probably give us confused faces when we ask them whether they know what Wayang is or not. And how often do we see dresses made out of batik as compared to dresses made by famous designers form overseas? Children know famous kings such as King Louis the VIV from France, but do they know who king Hayam Wuruk from the Majapahit Empire is? Indonesia is very blessed for it has a countless number of arts & traditions that bring out the best of our country, but our society has been brainwashed to appreciate cultures from different nations instead. This blurs their vision of Indonesia’s beauty. Another issue that we have in Indonesia today is the fact that there are ‘wars’ amongst different ethnic and religious groups. The simplest example is FPI (Front Pembela Islam), a social association that often burns down churches belonging to Christian Indonesians. Acts like this diminishes the entire point of Bhinneka Tunggal Ika. Are we not supposed to become one through our diversity? Our nation came together in order to achieve independence and this is how we are going to repay our ancestors? Through war amongst our own people? The Magnificent Kingdom of Majapahit: As it has been stated before in the introduction, there were once many kingdoms inhabiting Indonesia. One of the most noted kingdoms is the kingdom of Majapahit, an archipelagic and Hindu-Buddhist empire located in East Java. It stood from roughly 1293 until approximately 1500. This Empire reached its summit of glory during the era of king Hayam Wuruk, who sat on the throne from 1350 up until 1389. Alongside his prime minister, Gajah Mada, they brought the Majapahit Empire into its saturated state. To be more specific, during the era of these two historical figures, the Majapahit Empire dominated other kingdoms from other countries across Southeast Asia; including other kingdoms from Indonesia and also Singapore, Malaysia, Manila and East Timor. The kingdom of Majapahit is considered as one of the most powerful realms in the history of Southeast Asia. Not only that this Empire was able to take control of a diverse group of kingdoms from different parts of Southeast Asia, but the kingdom of Majapahit also focused on numerous activities to develop arts. A few of these activities are those under the essence of architecture. The Majapahit Empire is known for building temples using bricks. Do not be mistaken; although bricks have been used to create temples for a long time, the Majapahit society was the one to actually master it. In addition to the bricks, this society also utilized vine sap and palm sugar mortar in order to make the temples strong. Examples of temples built by the Majapahit realm are Brahu temple (Trowulan; the capital of Majapahit), Pari temple (Sidoarjo), Jabung temple (Probolinggo) and, of course, the Surawana temple (located near the Kediri area). Some of the temples under this kingdom’s names are preexisting temples that they have renovated. For example, we have the Penataran temple, the largest temple located in East Java ever since the era of Kediri. This temple was actually visited by king Hayam Wuruk himself during his royal trip around East Java. Their infrastructure methods and designs are still practiced by individuals living in Java as well as Bali up until today. The Majapahit kingdom is also the source of popular Indonesian literatures. Said literatures are actually considered as the Empire’s legacy. For example, in the folklore ‘The Legend of Minangkabau’ from Minangkabau, the prince was highly associated with the Javanese Majapahit kingdom. Other regional legends that are associated with the Majapahit Empire or perhaps king Hayam Wuruk and general Gajah Mada are found in locations such as Aceh, Palembang, Bali and even Brunei. A few of the Javanese legends that we know also originated from the era of Majapahit. Some of these legends include the tale of Sri Tanjung (also known as Kisah Banyuwangi and tells a story about a wife who is exceptionally loyal to her husband) and the epic of Damarwulan (a Javanese legendary hero who appears in the struggles between the Majapahit kingdom and the Blambangan kingdom). These stories flourished even after the downfall of the Majapahit Empire and are inspirations for Wayang, Ketoprak and mask drama performances. Reuniting our People, Raising the Awareness of the Majapahit Empire and Indonesian Cultures: The main goal that we need to pay attention to is how we can reunite Indonesians through our culture. Yes, many of us have lost our paths, but that does not mean that we will be lost forever. We must believe that beneath all the intense exposure towards cultures from different nations, there is still that sense of nationalism that lies within. However, it will not be easy to bring that sense of nationalism back to life. Therefore, we need to design a campaign that is so powerful that it will attract the hearts of our people. I am going to begin by implementing more Indonesian cultures in schools, especially for elementary students because I believe change should start from a very young age. National schools can intensify the Indonesian cultures they are already teaching and International schools can have annual events that are held to educate the students about Indonesia’s richness in diversity. An example of an annual event is actually one that was held in my previous school, Binus International School Simprug. In this annual event, the students are divided into four teams; Majapahit, Sriwijaya, Pajajaran and Mataram. However, my school mainly focused on sports and academic competitions, therefore it did not teach the students much about the history of those four kingdoms none did said competitions teach them about our diverse cultures. Therefore, for this campaign, the schools can create this event with competitions related to the history of Indonesia. The competing groups can perhaps act out a drama/Wayang performance and gather stories from the different Empires. This will expose them to the culture of said Empires and will enrich their knowledge about their history. Next, our campaign needs to also empower teenagers. Since a large portion of Indonesia’s population is composed of individuals between ages thirteen to nineteen, we need a large event that can include as many participants as possible. Therefore, I would like to suggest that we create an Expo with the name “Bhinneka Tunggal Ika.” The slogan of this Expo will be “Reliving the Glorious Empires of the Past.” This Expo is to be held in a large area. Why do we need a large area? It is simply because we will be recreating the once lost beauty of Indonesia that brought us to where we are now. The concept is similar to Taman Mini Indonesia, however we will focus mainly on the kingdoms. Therefore, temples popularized by Empires such as Majapahit will be rebuilt (smaller, of course). Folklores and legends that originated in the past will also be rewritten and retold, but perhaps with more modern words so that the attendees will be able to understand easily. The personnel that will be in charge of supervising the event will be dressed in traditional clothing depending on which kingdom they will represent. Traditional music will be played in order to create the traveling-back-in-time atmosphere. Teenagers who attend the event will be divided into groups, each with a tour leader, and they will travel around the area and observe the true beauty of Indonesia’s culture. This Expo can also show that, despite the large differences that each kingdoms have, we all managed to eventually become one and free our nation from the Dutch’s colonization. I believe that by getting to know our nation better, teenagers will be able to love Indonesia a little better as well. For young adults who are often busy with work and business expansions, we can organize seminars. These seminars will focus on the idea of unity through diversity. We will call the seminars “Berbeda, Bersatu, Berhasil” (Different, Become One, Achieve). Not only that the alliteration has a nice ring to it, but it also translates the key message of the seminar quite well. The main lesson that we will teach the attendees is that differences, when embraced, can create an innovation that may benefit Indonesia’s future. To those young adults interested in architecture, another program under our campaign that I would like to suggest is a design competition with the theme “Reliving Majapahit.” For this event, we can collaborate with Google Indonesia, for example, or other companies that are currently trying to increase their brand awareness in Indonesia. Basically, the designs will be very Indonesian. The winner will have their design built between the society and us. The fact that we let the attendees participate, we are destroying the wall of alienation. Letting them be involved in the flow of activities will boost their motivation. Limitations and Contingency Planning: No matter how appropriate our plans are, there will always be a tendency that something will go wrong. Therefore, we need to have our own contingency planning. For the school activities, there are possibilities that the students do not understand the system of Indonesia’s kingdoms enough in order to participate in the event. Therefore, we must make sure that the schools have provided adequate lessons prior to the said event so that the students will have a general idea of how it is going to be like. The Expo may just be the biggest challenge for us. First, let us discuss the promotional methods appropriate for this event. How do we promote the Expo? Will we gain enough attendees? Since our target market is composed of teenagers who are heavily exposed to technology, a good way of promoting this event is through Social Media. This means endless tweets on Twitter, updates on Facebook and perhaps an Instagram account that can be used to show sneak peaks of the designs for the Expo. During the day of the event itself, we may have lack of control. This leads us to the next contingency planning. We can let the teenagers themselves participate by becoming the personnel that will help the other teenagers learn about the different kingdoms. They will be trained beforehand and equipped with the appropriate information needed to answer any possible questions. Similarly to the Expo, the seminars can be promoted through the usage of Social Media. Young adults are also somewhat connected to various forms of Social Media such as Facebook, Twitter and Instagram, therefore promoting through said medium may help the message reach a larger range of audience. For the design competition, information and announcements can also be found on the partner company’s website (eg. The link on Google Indonesia’s homepage logo). The Windup: Indonesia is a nation that is rich in diversity; whether it may be in culture, ethnic groups or even religious groups. Different individuals have different lifestyles and values as well. However, Bhinneka Tunggal Ika was created through the belief that all these differences, despite how big they are, are able to become one. It is true that the Indonesia we know now is quite different from the Indonesia we have read in history books. However, that does not mean that we should sit quiet and let Indonesia become even more westernized over time. After all, do we really need to idolize kings from other countries when we have king Hayam Wuruk, a powerful Indonesian king who ruled many different kingdoms all across Southeast Asia? The Majapahit era taught us to embrace our own culture by developing it. This Empire also thought us that despite the fact that they are from Indonesia, they are able to rule those kingdoms from foreign countries. The way they were able to create an acquisition with foreign Empires shows that despite the differences, we can still become one. It is important that we, as Indonesians, help our country embrace its beauty in order to strengthen our society’s sense of nationalism. a. Creese, H. (1997). 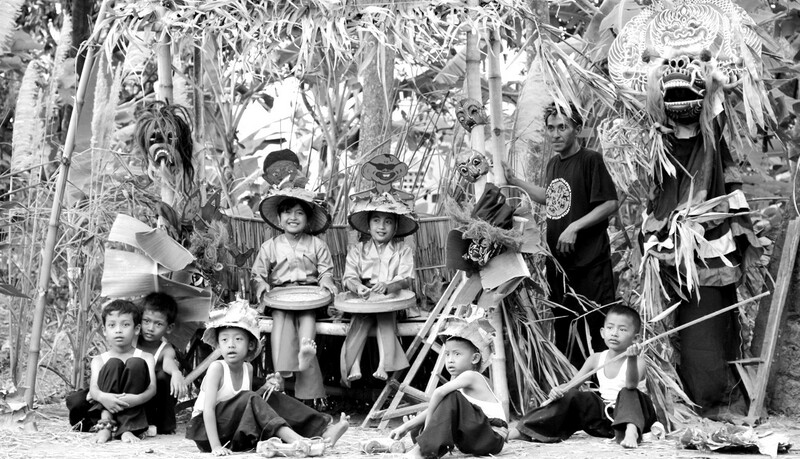 In search of Majapahit: The Transformation of Balinese Dentities. Clayton, Vic., Australia: Monash Asia Institute, Centre of Southeast Asian Studies, Monash University.